378 short-term observers of the campaign "Human Rights Defenders for Free Elections" are involved in daily observation of the early voting at 189 polling stations across the country. Observation results are processed on a daily basis and constitute a representative sample (observation covers 3.1% of the 5,971 polling stations). 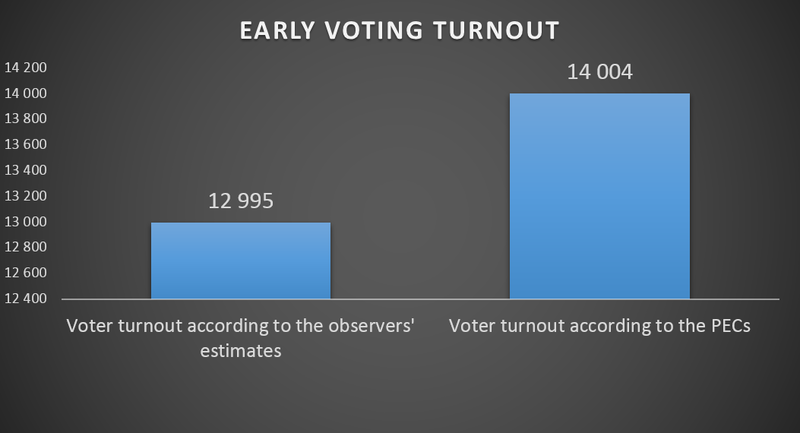 These data allow observers to estimate the basic tendencies of early voting. The below information was processed based on data received from 189 polling stations as of 23:00, September 7. According to the campaign’s observers, the number of voters registered during the second day of early voting amounted to 12,955 people, while the PECs’ protocols claimed there were 14,004 persons. The difference amounts to 1,049 people, or 7.5%. In the 2012 parliamentary elections, the difference was 3.2% based on observation at 150 polling stations. The abnormally large discrepancy between the numbers in the official protocols and the data reported by the observer was documented in the following polling stations: PEC No. 1, DEC No. 46 in Svietlahorsk (PEC data — 59, observers’ reports — 33), PEC No. 21, DEC No. 68 in Salihorsk (103 and 83, respectively), PEC No. 30, DEC No. 73 in Maladziečna (175 and 103, respectively), PEC No. 28, DEC No. 46 (94 and 43, respectively), PEC No. 10, DEC No. 72 in Maladziečna (106 and 45, respectively), PEC No. 29, DEC No. 2 in Brest (81 and 31, respectively), PEC No. 11, DEC No. 84 in Mahilioŭ (198 and 73, respectively), PEC No. 6, DEC No. 44 in Rečyca (120 and 60, respectively), PEC No. 31, DEC No. 42 in Mazyr (48 and 23, respectively), PEC No. 420, DEC No. 103 in Minsk (91 and 73, respectively). It should be noted that some of the polling stations that were not marked by the abnormal difference in voter turnout in the first day of early voting, showed such discrepancies on the second day of voting. At the same time, the PECs, where the campaign’s observers reported the highest difference in data on the first day, reduced their activity during the second day of early voting. 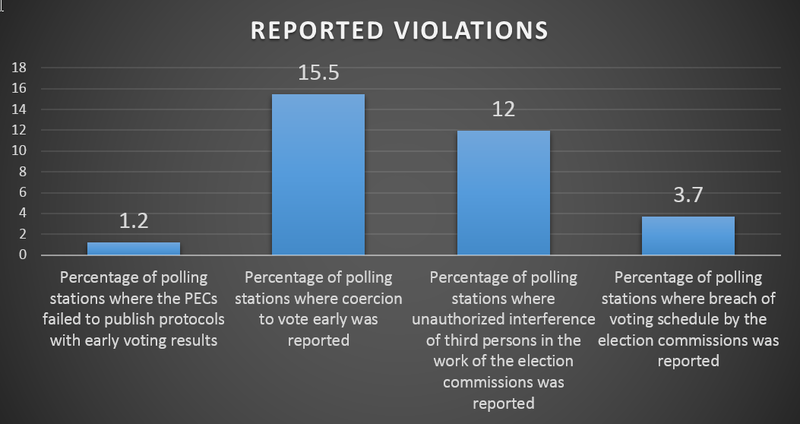 In general, the difference between the PEC data and the observers’ reports on voter turnout was documented at 43.4% of the polling stations covered by the observation. Just like in previous election campaigns, the observers report massive coercion of students to vote early.